Tracking down a citation you already have should be a relatively simple task. A colleague of mine asked for help the other day tracking down a citation. A variety of circumstances made it anything but straightforward and served to remind me about some of the confusing parts of the scholarly communication system (and that I really love my job). Tan, D. X.; Chen, L. D.; Poeggeler, B.; Manchester, L. C.; Reiter, R. J. (1993). “Melatonin: a potent, endogenous hydroxyl radical scavenger”. Endocrine J 1: 57–60. The student had found the citation via the Wikipedia entry for Melatonin. My colleague started out with the usual process – look up the journal, find the right volume and go from there. Except when you look up Endocrine Journal, you find that the volume number doesn’t match the year, nor are there any articles with a similar title in the publication. Author searches in the same journal also yield nothing. Since the citation came from Wikipedia, it’s seemed probable that there was an error. So she did a search on Google and Google Scholar to try to find a correct citation. Neither search turns up the article, but Google Scholar indicates that the article has been cited over 1000 times! The student found another article by some of the same authors on the topic and was content, but my colleague still wanted the answer. With other students waiting for reference help, she sent the question along to me. I was checking my email after my kids went to bed and thought I’d poke around a little to see what I can find. I re-did the searches my colleague did so that I understand the problem. Theoretically, the article has to exist, since it has been cited so many times. So why couldn’t we find it? I tried Google Scholar, PubMed, Scopus and found nothing (we don’t have Web of Science here). I searched for additional publications by the same authors but I still didn’t find anything close to this one. So I started looking for similarly name publications. The journal Endocrine Journal is published by the Japan Endocrine Society and the years don’t match up, so perhaps the abbreviation refers to something different? I located a journal called simply Endocrine (try finding that one in a Google search!) published by Springer. This started to look promising because the first volume of of Endocrine was published in 1993, just want we want. But this volume isn’t available on the publisher’s website, so I couldn’t confirm my suspicions. If Endocrine is the journal we want, why can’t I find it indexed in a database? I checked indexing information. PubMed only started indexing it in 1997. Scopus started indexing it in 1993, but only with the fifth issue, and we need issue 1. And Google Scholar won’t have it (other than the citation) because it isn’t on the Springer website or in PubMed. I start to think that the citation really refers to an article in Endocrine, not Endocrine Journal. But Scopus has over 1000 folks citing Endocrine Journal. It seems unlikely that so many people would make the same error. I stayed up past my bedtime having fun tracking this down. I emailed my thoughts to my colleague and I wondered if perhaps Web of Science indexed this item from issue 1. The next day, we asked a colleague at another institution to do a quick search for us in Web of Science. No hits on the article title. Perhaps Web of Science didn’t index it from issue 1 either, or perhaps I’m just wrong (it’s been known to happen). Then I checked Ulrich’s guide to periodicals. We have it in print here, and the brief entry illustrates the missing piece of our puzzle. The entry in Ulrich's clearly indicated this journals former title, a fact that is missing from the publisher's website. 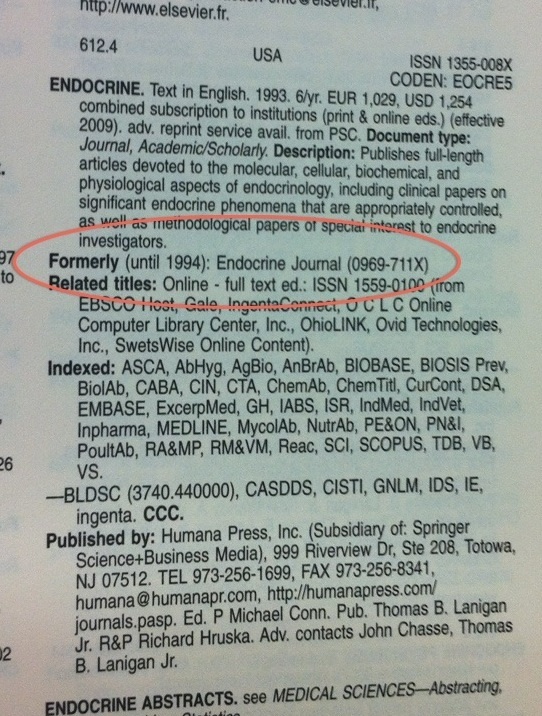 From 1993 to 1994 there were two Endocrine Journals! For a brief period of time (<2 years), Endocrine called itself Endocrine Journal. Perhaps they discovered the Japan Endocrine Society’s Endocrine Journal as the internet was making international collaboration easier. Since I found the original ISSN (0969-711X), I submitted an ILL request to confirm my thoughts. Sure enough, here’s the article masthead, but with Macmillan Press as the publisher, not Springer. The early issues available on the Springer website have Stockton Press as the publisher in 1995. It seems to have changed publisher several times. Screen shot of the PDF file I received via ILL. Note the publisher at the top. I picked the right profession because I had fun chasing this down. Given my difficulty tracking this down, I have to ask: How many of the 1000 folks that cited this article actually tracked it down? I bet there are some who never laid eyes on it. More importantly, it can be very easy for valuable information to disappear entirely. We live in an era of information overload. Yes, people have been saying the same thing since the invention of the printing press, but these days it isn’t a matter of finding any information, it is a matter of sorting to find the right information. And even today, an item published just before the explosion of online scholarly information could almost disappear. Although it may seem like it, not everything is available in Google. Ah, the joys of bad citation tracking. I once spoke to someone at a conference who had been trying to get a citation to their own article corrected by a journal. By the time they had gotten an agreement for a correction (over a year), the incorrect citation had started propagating as others cited the incorrect version. When I first saw this, I was thinking that the volume might have been J1–I had something similar once where we looked in vain for the “J of…” and it turned out that the J was the middle initial of the last author. Welcome to the world of IDS/ILL! I definitely use my reference “treasure hunting” skills several times a day with bad citations. Sometimes Google is a help, sometimes not. I just blundered onto this entry,; don’t know how I missed it in October. Terrific example of the frustration and joys of our biz. Thanks for sharing, as they say. you are right – that shouldn’t be this hard today.